First game I played was a teaching game... I was teaching. And apparently winning: a higher level player substituted for the last dozen or so moves, playing in the top left quadrant to see how I respond to attempts to create life. Here's the final position before we cut it short. My final play is marked with a circle. Particular focus on the top-left, cite of the high ranking player's play. He only played here because he wanted to experiment; I was doing life-and-death problems for a few hours, so he wanted to try to create life while the new beginner I had just taught wanted to watch. The squares mark his plays, though I forget what order. I also forget my responses; although the circle indicates my final play, which took me about a minute to decide on and I had no real idea why that seemed correct to me. It was at that point he announced that I had killed his group; as of yet, I can kind of see how that would have been an extremely strategic point, but I can't say for certain that that was critical to play or that not playing would have guaranteed life for black. It certainly is interesting though. I will study this position more in the future when I have advanced my game. 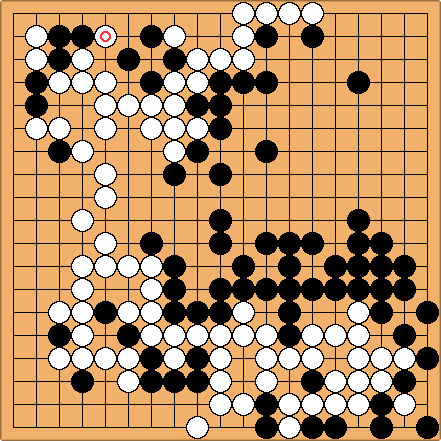 Again, this is from my first game, and the game was informal because I was teaching another player who never saw Go before. On further examination, it seems that the stones to the left of that play are most certainly dead. 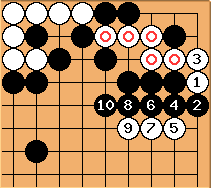 Other plays would lead to those stones connecting to the stones to the right; however, such plays could prevent the formation of two eyes, sacrificing some white stones in order to capture the whole lot. Because the whole of black's stones in white's territory are dead anyway, playing this out is pointless. I look forward to my second game... I think I'll read Janice Kim's second book, The Way of the Moving Horse, first. At this time I've only read the first and practiced a dozen or so Life and Death problems. White marked with square was played ages ago, and I assumed these stones are dead; let's examine this. Black to play. Black play at 1 leaves White to play at 2, capturing black marked as Square. This creates Ko for white 2. 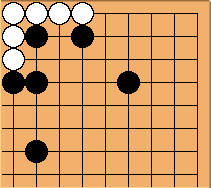 If Black wins the Ko, white plays and captures the two marked stones. 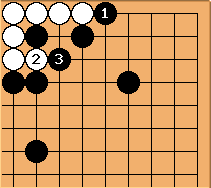 If White wins the Ko, then these 6 black stones are dead, and White secures 8 points of territory. Note that if black plays to connect the two stones captured on a black win, White will win the Ko since the appropriate response is the Ko. If Black wishes to avoid Ko, he can play at 1. White's best response at 2 captures the black pieces at Square. 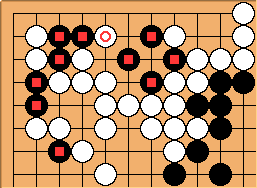 Black play at 3 solidifies the connection to the corner; White play at 4 captures the Black stones marked with circle. As we see here, white has gained 4 points of territory. If Black can win the Ko, he can deprive white of 4 points of territory; if Black loses the Ko, he concedes 2 additional points of territory to White. Note that the additional 2 stone capture further decreases Black's territory by 2 points from prisoner count during scoring, so effectively losing the Ko concedes 4 points total to White versus not playing the Ko. I question the wisdom and non-wisdom of territory invasion and non-invasion. For example, how does this affect final score? Let's say that Black caps off White's territory up top. Now that we have this, White has to make life or give up invading Black's territory, yes? Well, let's try. Black captures two, reducing White's final score by Two. Black however loses 4 points of territory in the process. How about this then? 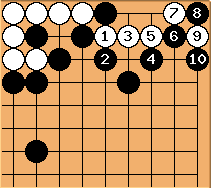 In this case, White loses 5 points to prisoners and black loses 5 points to territory, a net gain of 0. It seems that white's attempts to create life can only benefit white; for example, what about an incorrect play by black? 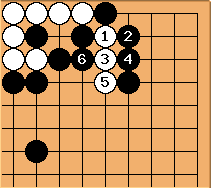 At this point, now Black is going to lose some territory having to corral White, who might start trying to extend further towards the center and create eyes. Ignoring the threat as "dead" will bring white back to life; it's quite possible for White to force Black to play 5 stones to capture 3, although many plays to kill will end up even as in the top-right here.